We're always waiting with bated breath for anything Melissa Shoes does because we love their shoes so much and their latest launch has us excited. They launched the 4th Edition of their Galeria Melissa + Collection, inspired by the locations of their three concept stores in Sao Paulo, London, and New York City. 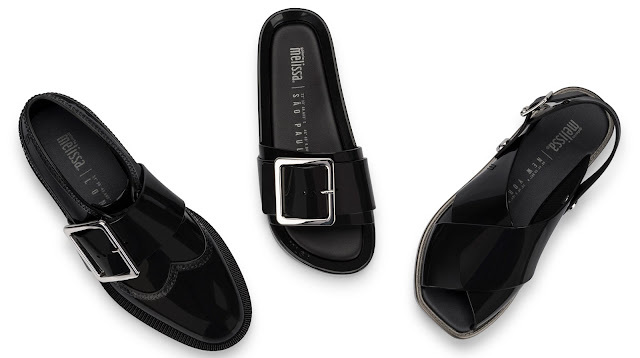 The capsule collection features new versions of three hits of the footwear brand, the Melissa Shoes Beach Slide (Sao Paulo), Melissa Shoes Classic Brogue (London), and the Melissa Shoes Sauce Sandal (New York City) - all in one color: black. In addition to the monochrome palette, two styles get the application of the full of personality silvery buckles in the front. The Melissa Shoes Sauce Sandal comes in a flat shape, lightly metallic and with apparent seams, giving the model a contemporary and irreverent touch. The capsule collection also brings another feature, for the first time, a shoe developed exclusively for the Galeria Melissa stores reaches to an extended unisex sizing. The Melissa Classic Brogue, inspired by the English classic famed for its furrows in the front, is available in sizes from 5 to 14 (or 35 to 46.5 for UK). The 4th Edition Galeria Melissa + Collection is available at the Galeria Melissa of São Paulo, London, New York, and www.melissa.com.br/us.